IronmongeryDirect, the UK’s largest online and mail order supplier of ironmongery products to the trade, has launched its latest winter catalogue. 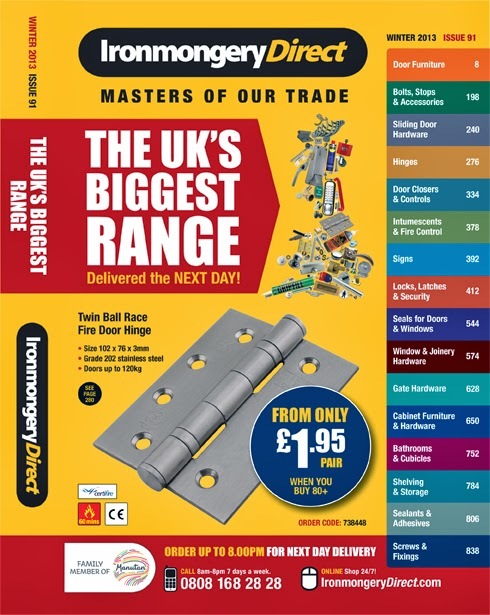 Designed to help tradesmen confidently choose the best product for any job, the new issue showcases all the latest products available in the massive range. The brand new 900 page catalogue contains over 14,500 top quality products, ranging from door furniture and accessories, locks, latches and security to screws and fixings, and includes top brands such as Briton, Yale and Union. The handy guide includes key compliance information, plus further information such as technical drawings, which can be downloaded in full from the website. It’s also packed with high quality, colour images to support tradesmen in choosing the perfect product for the job. Boasting some of the lowest prices in the trade, IronmongeryDirect has also locked down prices on thousands of its products to ensure customers continue get the best deal and save money. Major deals include a Briton Satin Chrome Codelock available at only £19.80 and a Twin Ball Race Fire Door Hinge from only £1.95 a pair. Bulk buy discounts are also available and all products are quality guaranteed for a minimum of five years, giving tradesmen complete confidence in performance and durability. Orders can be quickly and easily placed via the website, mobile app or by calling the customer contact centre, which is open 7 days a week from 8am to 8pm. Tradesman can order up to 8pm for next working day delivery, which is free for all orders over £45. The complete range is covered by a free returns policy meaning any unsuitable items can be returned hassle-free. Tradesmen on the go can take advantage of the IronmongeryDirect app where they can browse the entire product range, search for a specific item, shop securely and even track orders. The free app is available from the Apple App Store or Google Play Store.